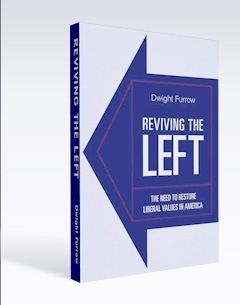 Posted by Dwight Furrow in Dwight Furrow's Posts, Political Philosophy, politics. American political writers constantly claim that Europe, although a nice place to visit, doesn’t really produce enough wealth to make it livable. This column by Ross Douthat is the most recent of the genre. This belief is part of the narrative that social democracies, because they devote lots of resources to public goods and a social safety net, are less efficient than full-blown capitalist economies. Matt Yglesias has the right response to this argument. These last two show us what I think is the real meaning of social democracy for a developed country—you get more equality and more vacation, with no real impact on the rate of growth. There’s a case to be made that less vacation and better televisions are a better deal than more vacation and worse televisions (the two things I like to do on vacation are go to Europe and watch TV, so I have mixed feelings about this) and there’s a tradition of philosophical argument which holds that the failure of modern mixed economies to be sufficiently solicitous of the interests of the wealthy is a major source of injustice. But though some level of income inequality would seem to be necessary to achieve economic growth, within the range that actual developed countries exist at there’s no evidence that inegalitarian policies boost growth. 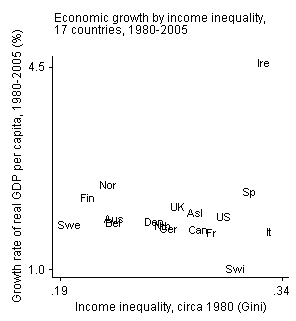 Aside from the outlier, Ireland, it is hard to see a correlation between growth rate and inequality. This is another right-wing talking point that needs to be scrapped.